There are much confusions and debates over the choice between iSCSI and FCoE (Fiber Channel over Ethernet) for SAN storage choice, especially when you have invested on the Cisco Nexus data center infrastructure. Both choices are well supported by Nexus and both can definitely run concurrently together with the data network traffic. On top of that, you can even run both Jumbo and non-Jumbo frames without any loss in packets and performance! This truly fulfill the promise of "Unified Fabric Data Center". The main advantage of iSCSI is its low-cost and its ease of implementation. You don't need any additional hardware on your existing servers and you can run it off on any server-class Gigabit Ethernet NICs that support TCP offload (even though it's non-mandatory). Because iSCSI runs on top of TCP/IP, you may suffer some slight deterioration in performance due to its inherent latency, especially when you have to route the traffic over L3 hops. FCoE, on the hand, is a replicate of existing FC technologies (except the physical cables, it simply replaces the Fibre Channel physical layer with 10GbE). If you do own existing FC infrastructure (i.e. 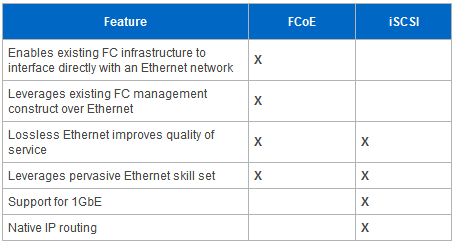 Cisco MDS) and intend to "migrate", "converge" or "consolidate" into Ethernet infrastructure, FCoE would be the choice. You can simply map VSAN into VLAN on the Lossless Ethernet-based Nexus for inter-operability. Typically, you would need Converged Network Adapters (CNAs) on the servers, which contain both Fibre Channel Host Bus Adapter (HBA) and Ethernet Network Interface Card (NIC) functionality on the same adapter card. CNAs have one or more physical Ethernet ports, which facilitate transition and migration from FC to FCoE. Below is a good comparision table between iSCSI and FCoE taken from this NetApp site.